This past weekend I was in Sackville, NB for Maritime Conference, more specifically, I was there for Youth Forum. This was my 5th Youth Forum over the last 8 years, and I love working with the youth. But this year was different. This year I was feeling very down about going to Maritime Conference, in fact I was feeling dread. I arrived on Wednesday afternoon to set up for the kids coming, and to be perfectly honest, if I could have gone home I would have. Such was my mindset going in. I spent significant time in prayer asking God to show me how I fit into this weekend. I asked him to show me why I was even there. I prayed for guidance and vision pouring out my heart. This year a particularly difficult issue was coming to the floor of conference, one I was in opposition to, and one I knew would exclude me from feeling like I could fully participate in the future of the United Church of Canada in this place. In fact, I attempted to amend the motion so that it would include me and my like-minded friends, but the amendment was ruled out of order. This was the first morning of conference. This is also when God began to show me why I was there. There were youth there who needed someone to talk to, and sought me out. I had incredible discussions with them about life and how we all fit in. I had conversations with people who thanked me for my attempt to amend the motion on the floor, they told me it sparked some great discussion at their tables. But I also received much more than I gave. The youth and leaders of youth forum were SO INCREDIBLY supportive of me and the struggle I was facing in the church. The youth could not understand why my position was being excluded as the church sought to be more inclusive. In fact, some were wanting to speak their mind about what they perceived as an injustice on the floor of conference. So many people kept checking in with me to see how I was doing. Never before have I felt so welcomed in the United Church of Canada. It wasn’t the conference. It wasn’t the delegates who made me feel this way. And it most certainly wasn’t the processes and debates. They get inclusion. They understand what it means for the church to be a safe place for all people, including conservative evangelicals like myself. 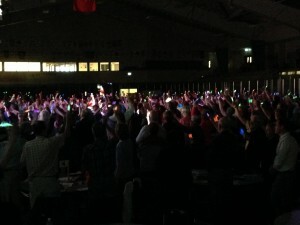 Thank you Maritime Conference Youth Forum, you saved me from a weekend of dread and turned it into a weekend of hope.